Salvador’s shore goes from Praia do Porto to Praia do Flamengo. It is intensely developed for over 20 kilometers long with lots of action at the bars and restaurants that line the beach going well into the night. If you begin at Praia do Porto, with its calm and deep waters, very much searched by city visitors. You can also choose between Praia do Farol and Praia de Ondina, whose reefs make up small low tide swimming pools. Praia de Amaralina and Praia de Armação have strong waves, very much sought by surfers. The beaches in Pituba, Corsário, Jaguaribe, Piatã and Placafor are sought for their sand’s softness and water quality. Honored by poets, singers and lovers, Itapuã offers bucolic scenarios and a relaxing environment. Stela Mares and Flamengo are farther and also enchanting. Near the shore, there are two parks with natural lagoons and incredible beauty: Parque do Abaeté and Parque de Pituaçu, which offer leisure options day and night. Nightlife in this area is intense and marked by Lagoa do Abaeté and Coqueiral de Piatã’s poetic and romantic atmosphere. In Rio Vermelho and Barra neighborhoods’ shore there is a great number of theaters, bars, and restaurants, which guarantee great fun with music and shows. Here you'll find the old Monte Serrat lighthouse and church (good crab at the barracks). Nearby is Praia da Boa Viagem, where one of Bahia's most popular and magnificent festivals, Procissão do Senhor Bom Jesus dos Navegantes, takes place on New Year's Eve. The beach is lined with barracas and barzinhos (literally: little bars; this term is used to denote the simple unpretentious bars that Salvador is full of) and is animated on weekends. It's a poorer part of town and quite interesting. Ribeira -- On the bay side of the city, not too far from the Igreja de Bonfim on the peninsula of Itapagipe in the lower city (cidade baixa). Built in 1745, the shrine is famous for its miraculous power to effect cures. From the church there is a very interesting half-hour walk to the bay. bay with calm and crystal waters, offering the city’s best bathing. It is also the place where Tomé de Souza, city founder, first arrived. The site of Bahia's first European settlement, Vila Velha, or the Old Village. On the mouth of the bay between 2 historical forts, it has an intimate atmosphere and good swimming and snorkeling. It is popular with the locals as a place to meet and hangout. On weekends, especially Sundays, the beach can get very crowded, The beach being the first set within the bay and the water is much calmer and thus good for swimming than on the oceanside beaches. Farol da Barra: at the beginning of Baía de Todos os Santos, the sea is strong and ideal for surfers. It is also home to one of the city landmarks, Farol da Barra, besides a dozen of restaurants of all specialties. The sunset at Farol da Barra Beach One is a favorite postcard icon of the city, not only because of the natural beauty but the enchantment of seeing the lighthouse superposed sunny self on the bay waters.
" The “Farol da Barra” beach is not the place where you can find beautiful people, but is a traditional site with “baianas” (native women in their white dresses) cocking specialties from Bahia, as “acarajé”, “bolinho de tapioca”, “abará” e “vatapá”. So you must go there for a walk and appreciate the nice sunset from there tasting some of the spices from Salvador. But be careful because some of them can be HOT! Drink also the coconut water that is very sweet and cheap." Farol means a beacon; here "lighthouse" At Farol da Barra the barracas are the more standard Bahian issue -- tropical-looking thatched huts. The end of the beach closest to the lighthouse is rocky, with protected pools making it a good place for kids to safely play in the water. The far end of the beach is usually surfer territory. A complex of courts and pools sculpted by the rocks, the beach is an excellent option for all ages. 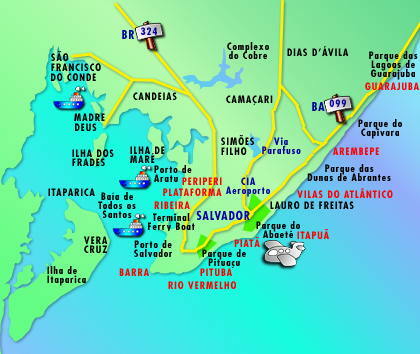 This is the neighborhood where the city’s best hotels, the governor’s official home (Palácio de Ondina), the zoo, and good restaurants are. Offering two small bays for bathing: Paciência and Mariquita beaches. The variety of bars and restaurants is also an important feature of the area. Iemanjá Festival At Largo de Santana, there are the 100-year-old church Igreja de Santana and Casa de Iemanjá, where gifts to the Queen of the Sea leave from, every February 2nd . Neighboring beaches, Ondina and Rio Vermelho, host Salvador's most expensive resort hotels, while Rio Vermelho has some of the city's best bars and music. The “acarajés” in the “baianas” kiosk, served with coconut milk make the place an important stop, besides its beauty. Full of rocks on its yellow sand and located in one of Salvador’s most populated neighborhoods, this beach receives a great number of visitors on the weekends and offers a great variety of bars and restaurants. This beach of agitated waters has a grass coconut tree plantation that is admired and visited by people from Bahia and tourists. It has a peculiar beauty and provokes intense inspiration on its moonlight nights. This is also the shore’s spot where Parque Costa Azul is located, with areas for sports, leisure and culture. Previously named Chega Nêgo, this beach used to receive ships where black African slaves were transported during the time when official traffic was prohibited. Slaves were placed in a “senzala” built by the sea, until they could be negotiated. In Armação there is also Centro de Convenções da Bahia, some good quality hotels, and some of the most sought restaurants in town. home for Bohemians, musicians, poets, and intellectuals, this beach has a beautiful coconut tree plantation and nice courts. Dozens of bars and restaurants help compose the place’s structure. Many youth prefer these beaches which are great for surfing. Day and night, there are live music shows in many bars, attracting many people who are also interested in having crab. In Corsário, lies one of the city’s most important leisure and environment preservation areas, Parque Metropolitano de Pituaçu. Piatã while a huge ocean beach though is still quite sheltered and thus good for playing around in the waves. Near the airport is a black freshwater lagoon. The large area surrounding the lagoon has been targeted by the City of Salvador for clean up and tourist infrastructure development. Many tourist buses visit the location to admire the spectacular contrast of its black waters and its white sands. Sung by musicians and poets such as Vinícius de Moraes and Dorival Caymmi, this beach has calm waters, food and drink stands, and a fishermen community. It is ideal for bathing and practicing sports such as windsurfing. The beach at Itapoan starts at almost right angles to the general lay of the beaches running up the coast, then it rounds a bend and a bit further up is another lighthouse, the Farol de Itapoan. Now, the waters off that first stretch of beach tend to be calm and good for swimming but just beyond the Farol the waters can be treacherous. The fact that there may be surfers out there shouldn't be misread; they know the currents and they know what they are doing. Stella Maris: youth and ecology defenders’ hangout place, this beach has agitated waters ideal for sports such as surfing, jet-skiing and body-boarding. There is a great number of stands with delicious food and ice-cold beer. A very pretty beach with lots of rocky outcrops, quiet atmosphere; more eating and drinking etc but more chilled. "Though it is relatively peaceful during the week, it has an incredible party atmosphere on summer weekends and especially Sundays when it is full of the locals eating, drinking, dancing and getting to know each other better. there are coconut trees, reefs and strong waves for surfers. It is one of the most sought on weekends with a more "upmarket crowd.."